Windy Anemometer application use external Navis wireless sensors to measure wind speed, direction and air temperature. Compatible sensors: WINDY MARINE, WINDY B/S, WINDY B/SD. If you don't have your sensors yet, please select "GET SENSOR" in application's settings menu. For receiving data from sensor, make sure that sensor is active (rotate sensor wind cups for sensor activation). Each sensor has its own address, which is written on label on the sensor. Navigate to Settings ("+" in top right corner of main view) and enter your sensor's address into "Address" field or select "Find sensor" for automatic scan. Display wind speed data form sensor in selected unit. Display wind direction data form sensor in degrees depending on the selected wind direction averaging interval. Tap and hold MAX value on main screen for 2 seconds and MAX speed will be reset. Display wind speed data depending on the selected wind speed averaging interval. Tap and hold temperature value on main screen for 2 seconds and Windchill will be selected. When wind speed exceeds set alarm value, dispayed wind speed become red and optional alarm sound turn ON. For navigating through graphs, use right to left swipe gesture to display next or left to right to display previous graph. "Temperature" - temperature in last 24h. Tap and hold graphs surface on main screen for 2 seconds for download graphs data from sensor. Download function is available only for WINDY MARINE sensors. b) if you already have account, on the main view of Navis LIVEDATA web interface select "Add new adapter"
In registration form select "Register with Windy App" and follow instructions for application registration on Navis LIVEDATA web interface. 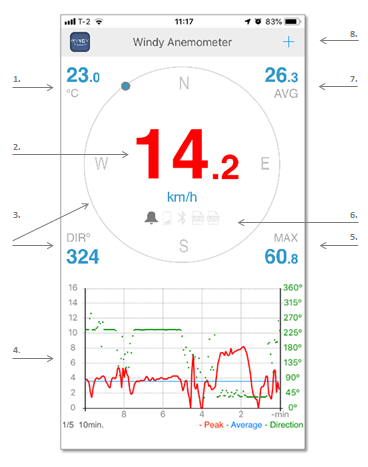 Wind speed, wind direction and temperature data will be sent to Navis LIVEDATA web interface if application receive data form Navis wind sensors and Wi-Fi or cellular are enabled on you smart device. 1 - Air temperature - data from sensor's built-in temperature sensor. 2 - Wind speed - in selected units. When wind speed exceeds alarm value, numbers become red. 3 - Wind direction - wind direction graphical and numerical display. 4 - Graphs - shown selected graphs interval. 5 - MAX - max. wind speed. - Alarm - icon shows up when alarm function is enabled. - Low battery - icon shows up when battery in sensor is low and needs replacement. - Signal - icon flashes every time data is received from sensor. - LIVE - icon flashes every time data is send to Navis LIVEDATA web interface. - LOG - icon shows up when LOG function is enabled. 7 - AVG - average wind speed. 8 - Settings - application settings menu. Enter settings with "+" in top right corner of main view. Name - set sensor name. Address - set sensor address (each sensor has its own address, which is written on label on the sensor). Auto OFF - set sensor "Auto OFF" interval (only for WINDY MARINE sensors). Automatic download data - turn ON/OFF automatic download graphs data from sensor at fresh application startup (only for WINDY MARINE sensors). Find sensor - use for automatic scan of nearby sensors. Get sensor - navigate to Navis store for sensors order. Wind speed - in units of m/s, km/h, kt, mph. Temperature - in units of °C, °F. Activated - activate wind speed alarm. Deactivated - deactivate wind speed alarm. Sound - activate/deactivate sound when alarm occur. Value - alarm value/limit in speed unit set in wind speed unit section. Activated - enable sending data to Navis LIVEDATA web interface. Deactivated - disable sending data to Navis LIVEDATA web interface. S/N - enter serial number generated on Navis LIVEDATA web interface. Restore defaults - reset all settings parameters, except sensor address and calibration parameters. - application will increase battery consumption of smart device because of active Bluetooth communication. - application will use Wi-Fi or cellular for sending data to Navis LIVEDATA web interface. Additional chrges my apply depending on user Wi-Fi/cellular data plan. - application developers does not accept responsibility for any problems which may arise from applications other than those the product was designed for. - any liability for direct or indirect damage caused by application failure is excluded. In case of any kind of problems with software or critics/improvement ideas, please write to developers. © 2019 by Navis elektronika. All Rights Reserved.